We have a new way of seeing the world. From entertainment to healthcare, the possible applications of 3D digital holograms are numerous. Unfortunately, current holographic displays are nowhere near as advanced as science fiction movies have led us to believe. Right now, most virtual reality (VR) and augmented reality (AR) setups simulate a 3D viewing experience by projecting two separate 2D images that are viewed using special glasses. It is possible to create 3D holograms that can be viewed without glasses by using wavefront modulators, which control the direction of the light, and deformable mirrors (DMs). The problem, however, is that even our highest resolution displays don’t have enough pixels to produce a 3D image. This means that we are only capable of creating a hologram about a centimeter (.4 inches) big with a viewing angle of three degrees. That may not be the case for long. 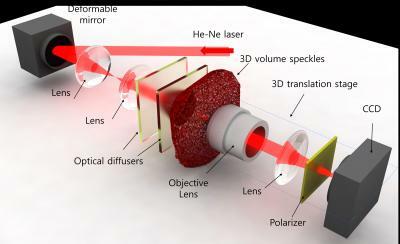 The Korea Advanced Institute of Science and Technology (KAIST) has managed to improve the quality of 3D holograms significantly using a DM and additional diffusers to scatter light. Scattering the light allows for wider viewing angles and a larger projected image. It also results in unwanted volume speckle fields, which they addressed by using a wavefront-shaping technique to control the fields. KAIST’s technique produced a bigger 3D holographic image: two centimeters (.8 inches) in length, width, and height, with a 35-degree viewing angle. That’s an almost 2,600 times improvement in quality over any existing holographic technology. If they can continue to scale up this technique, it would spur further advancements in holography and improved AR and VR technology.